Building work is almost finished on First Avenue, the new $136 million shopping mall and hotel development in Motor City, Dubai. The project’s backers said in a statement that construction work for the mall is on track for completion by the end of this month, with fit-out for the retail units set to take another four months. The mall is expected to open in May, along with the adjoining hotel, the statement said. It added that First Avenue’s anchor tenants are in place, taking up 40 percent of the mall’s leasable area, with Carrefour taking up 11 percent and Prime Medical Centre and Fun Block, part of Fun City by Landmark Group, taking 9 percent each. Reem Al Bawadi, the Arabic food and beverage chain, will take up 6 percent while ACE Hardware, the world’s largest hardware retail cooperative selling products to fix homes and businesses, will have 5 percent of the leasable area. First Avenue is owned and operated by Saudi Arabia’s Al Tawfeeq for Development and Investment (ATDI). 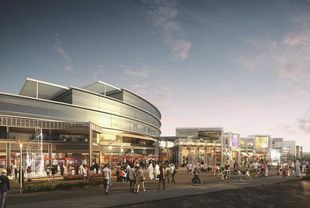 First Avenue, based at the edge of the Dubai Autodrome, will have 70 high-street retailers and 15 casual dining restaurants. The adjoining four-star 150-room hotel, which can be accessed directly from the mall, will be operated by Park Inn by Radisson, with an all-day restaurant, lobby, meetings and events spaces, gym, spa and swimming pool.